When creating a template or case, you can build in internal case sections specifically intended to house materials added to the case by Individuals, Committee Managers, and Administrators. Only Individuals, Committee Managers, and Administrators, can see internal case sections, and all materials within them are completely invisible to the candidate. Internal case sections do not involve requirements. 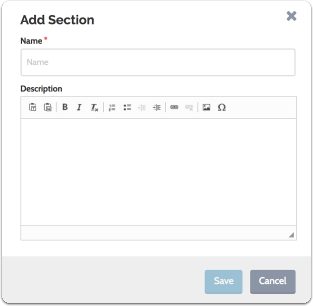 You can still set up committee-facing document requirements as part of a workflow step. 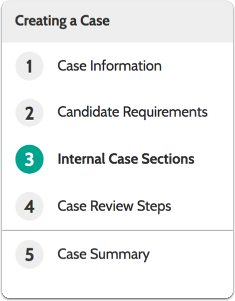 At both the template and case level, internal case sections allow you to group together all documents that are neither documents added by the candidate, nor external evaluations, and ensure that these documents remain completely invisible to the candidate. When adding internal case sections, you also have the option of including a special section for requesting and collecting external evaluations through the system. This article shows briefly how to set up Internal Case Sections. Internal case sections can be added at the 3rd step in the process of creating a template or case. A single packet section labeled "Committee Documents" appears by default. You can edit or delete this section. By default, we include an internal facing section for requesting and collecting external evaluations through the system. Click "Remove" if you want to remove the external evaluation section from the template or case. See the article Requesting External Evaluations to learn more about the process.